Toluene is just one of many toxic chemicals that are known to be present in cigarette smoke. Smokers (and non-smokers breathing secondhand smoke) are exposed to toluene at higher amounts over people who don't come into contact with cigarette smoke. Let's take a look at what toluene is and the hazards it presents to our health. What Is Toluene and Where Is It Found? Toluene does occur in nature, where it can be found in the sap of the Tolu Balsam tree from South America. It was first discovered by Polish chemist, Filip Walter in 1837. It also occurs naturally in crude oil. The vast majority of today's toluene, however, is harvested as a by-product of gasoline production, as well as other fuels manufactured from crude oil. It's sometimes added back into gasoline to improve octane ratings. It's also a by-product of making petroleum coke from coal. Toluene is primarily used as a solvent. It's a clear liquid with a sharp odor that is easily discernible in small amounts. It evaporates quickly. Toluene is in many products that most of us use or come into contact with occasionally. Nail-polish and remover, lacquers, paint and paint thinner, glues, inks, and stain removers all contain toluene. On an industrial level, toluene is used to make rubber, tan leather, and is used in the printing process. It's used in the manufacturing of numerous chemicals, such as benzene, benzoic acid, benzoyl chloride, and toluene diisocyanate. The production of nylon, plastics, polyurethane and even explosives (TNT) all use toluene in the manufacturing process. Toluene is also found in vehicle exhaust and cigarette smoke. While it is possible to come in contact with toluene from water or soil where it may have leaked into the environment, most people are exposed to it by breathing air that contains toluene. How Much Toluene Is in Cigarette Smoke? Toluene is a major component of cigarette smoke, but the amount can vary considerably, depending on cigarette composition and how it is smoked. Mainstream smoke (the smoke that is exhaled by the smoker) contains less toluene than sidestream smoke (the smoke wafting from the end of a lit cigarette). Mainstream smoke from an unfiltered cigarette can contain approximately 100 micrograms of toluene, while sidestream smoke typically measures in the 1000 micro-gram range for this toxin. What Happens When a Person Is Exposed to Toluene? Once inhaled, approximately 20 to 40 percent of toluene will be exhaled back out of the body, but the rest travels to the bloodstream from the lungs. Most of it then leave the body within a day, usually in the form of hippuric acid, a less harmful chemical that is excreted in the urine. If a person comes into contact with toluene by touching it, it can go through the skin and into the bloodstream. Similarly, if ingested, toluene is absorbed into the body through the GI tract and then on to the bloodstream. If a person is exposed to toluene on a daily basis, a small amount can accumulate in fatty tissues. Some people sniff substances like glue that contain toluene to get high. This activity is popular among teenagers primarily, due to the availability and cost of glues, solvents, and aerosol sprays. When in liquid form, the solvent is usually emptied into a plastic bag which the person then puts up to their face, inhaling deeply. In addition to the health risks from toluene exposure, there is also a danger of suffocation from breathing in a plastic bag. Aerosols and glues are often inhaled directly. Inhalation of toluene produces euphoric feelings that can make users feel invincible. The effects are similar to alcohol intoxication, with reactions ranging from impaired judgment to agitation, apathy, and loss of coordination. Toluene is thought to interfere with brain and nervous system function. Short-term exposure can cause headaches, dizziness, and the ability to think clearly. Longer-term use of inhalants containing toluene can cause serious damage that might become permanent. Vision and hearing loss, memory loss, and decreased mental function are all possible, as is kidney and liver damage. High doses of inhalants can cause confusion and delirium, drowsiness and muscle weakness. A state of stupor, unconsciousness, and even death are possible due to how toluene affects the respiratory system and heart rate. Research suggests that a high level of exposure to toluene (such as would be received by daily inhalation) by pregnant women may lead to decreased mental function and growth in the child she's carrying. To date, there is no evidence of a direct link between toluene and cancer. The International Agency for Research on Cancer has not classified it as a cancer-causing agent in humans. The United States Environmental Protection Agency has stated that there isn't enough information on toluene to make a determination on its potential to be carcinogenic at this time. While the amount of toluene in cigarette smoke is far less than what you would receive if you were intentionally inhaling solvents, it is a dangerous toxin that is not good for the human body in any amount. It's hard to say whether it contributes to the headaches and occasional dizziness that can be common with smoking, but it is certainly possible that toluene is a major contributor to the ill feelings that sometimes follow cigarette smoking. Cigarette smoke is filled with literally thousands of chemical compounds, many of which are poisonous, cancer-causing, or both. Research continues to unveil new toxins and dangers associated with cigarette smoking as time goes by. 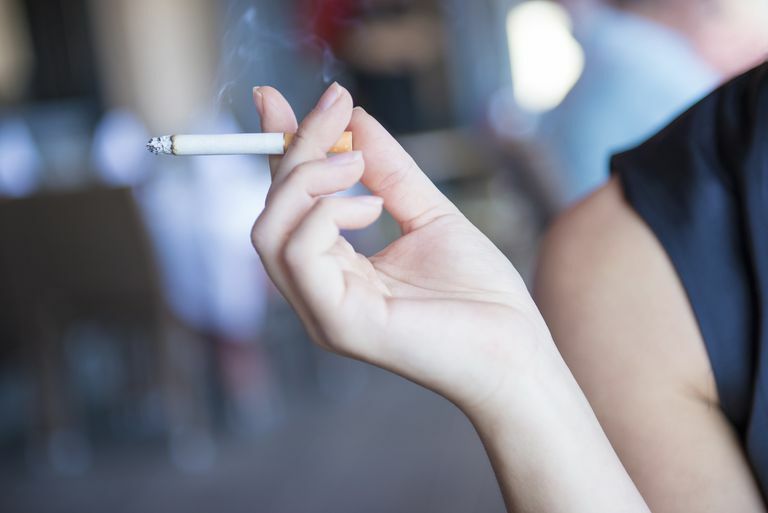 The best thing that you can do to avoid exposure to the dangers that cigarette smoke poses are to not frequent places where people are smoking, especially if it is in an indoor environment where chemicals are trapped. The air and even surfaces in these places are toxic to your health. If you're still smoking, use this information to help you build the resolve to stop, once and for all. Yes, it will take some work, but remember that you are recovering from an addiction, and once through it, life will improve dramatically. Others have quit, and so can you. Agency for Toxic Substances and Disease Registry. Public Health Statement for Toluene. Updated and Reviewed January 21, 2015. National Institute on Drug Abuse. What are the Short- and Long-Term Effects of Inhalant Use?. Updated July, 2012.